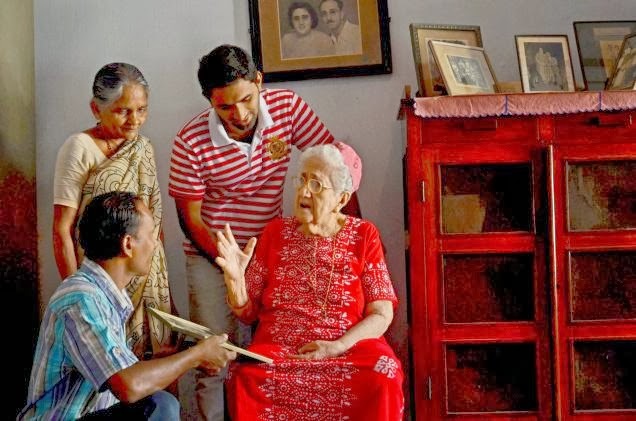 Jews of Malabar: Untold story of a Cochin Jew and Bailey's Malayalam Bible. 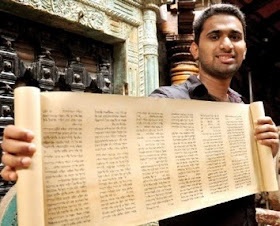 Untold story of a Cochin Jew and Bailey's Malayalam Bible. 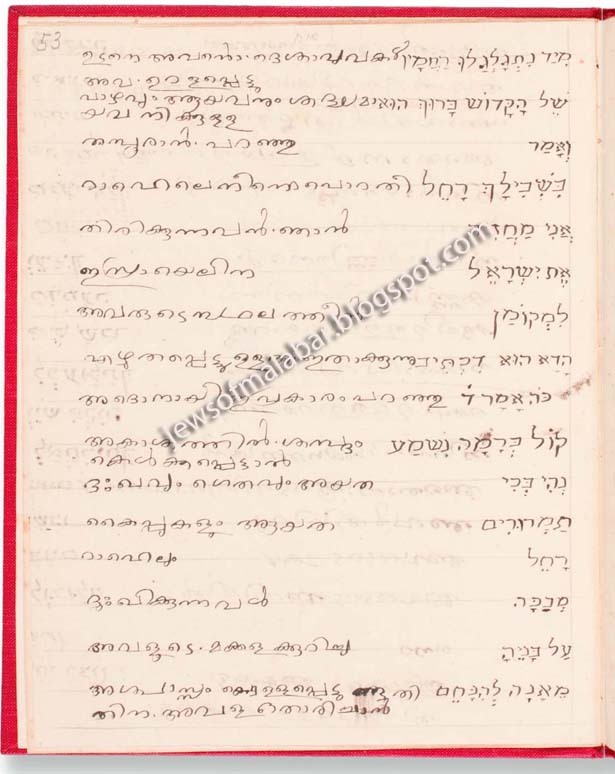 The article also lists out the details of the Hebrew-Malayalam manuscripts collected by David Solomon Sassoon (1880-1942) which includes biblical portions, commentaries, occasional prayers, Jewish liturgical poems, and hymns. A brief history of initial translation of Malayalam Bibles. 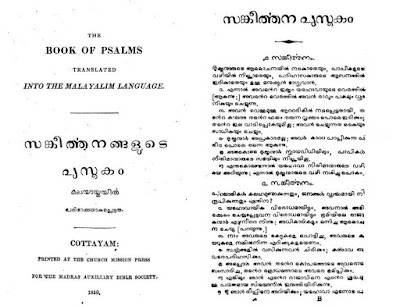 Bible translation work in Malayalam is of unique interest, the translation being made from the Syriac, with some help from Johann Phillip Fabricius's Tamil version, by Kayamkulam Philippos Ramban and Timapah Pillay. 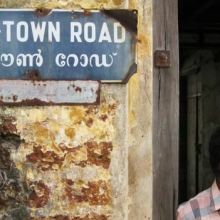 Timapah Pillay went to Bombay, where a font of Malayalam type had been cast, and he supervised the printing. Even though translation was completed or initialised in 1807, The book was published in 1811 and was later known as Ramban Bible. Successive British residents at Travancore took a deep interest in the work, first Colonel Colin Macaulay, and then Major John Munro, who had been the means of establishing a college at Kottayam. Timapah Pillay had translated the whole New Testament from the Tamil by 1813, but there were difficulties about revising it and publication was delayed. In 1817 it was resolved to translate the whole Bible and print it at Kottayam. The C.M.S. lent their missionary, Benjamin Bailey , for this work, and he was to be assisted by eight Syrian priests and some local linguists; they were to be paid by the Bible Society and supervised by Major Munro. The Calcutta Auxiliary was also considering another New Testament translation from the Vulgate, under Roman Catholic superintendence, though the vicar-general did not object to the translation already made. The Madras Auxiliary Bible Society published his translation of the New Testament in 1829. 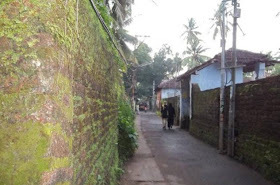 It was not in the purer Malayalam; Bailey became busy with the Old Testament and completed it. A committee revised the texts and the Madras Auxiliary published Bailey's translation as it stood, the complete Old Testament appearing in 1841-42. In 1846, he published the first English-Malayalam dictionary and Grammar of Malayalam in 1869 these books not only displaced earlier tentative efforts, but they are still regarded as standard works. Revised edition of Bailey's Old Testament was issued in 1859. He returned to England on 20 March, 1850 after 33 years of mission work in Kerala. A page from the Book of Psalms, printed in 1938. One of the first portion from the old testament translated to Malayalam. There is an untold story of a Cochin Jew who assisted Bailey in his Old testament translation. 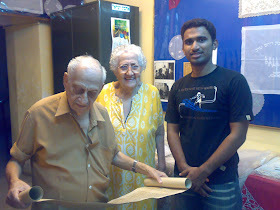 He is another unsung legend of Cochin Jewry. 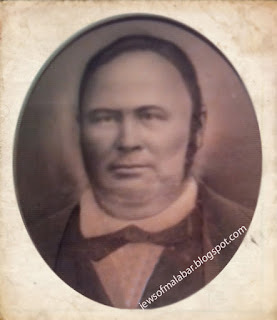 Moses ben David Sarphati, the Hebrew professor of Kottayam Christian missionary society. The surname Sarphati is believed to have their origin from France as the word SARPAT is the Hebrew word for France. According to the history this family came to Cochin in 17th century. 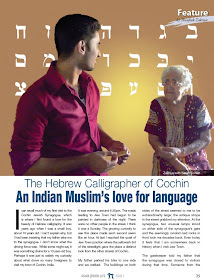 They are professional writers and are seen in communal agreements of Cochin Jewish community. Moses ben David Sarphati was a liberally-minded Jew, who is mentioned in many missionary records for his kindness and generosity. He was one among the linguists who helped Benjamin Bailey on Hebrew language in his complete translations of Old Testament Bible. He was the Hebrew Professor of the Kottayam CMS, many of the Malpans (The Syriac word "Malpan" means teacher. Elderly Christian priests who used to teach and train candidates to priesthood were usually referred to as Malpans) were practising Hebrew lesson under him thus he was a teacher to the teachers. 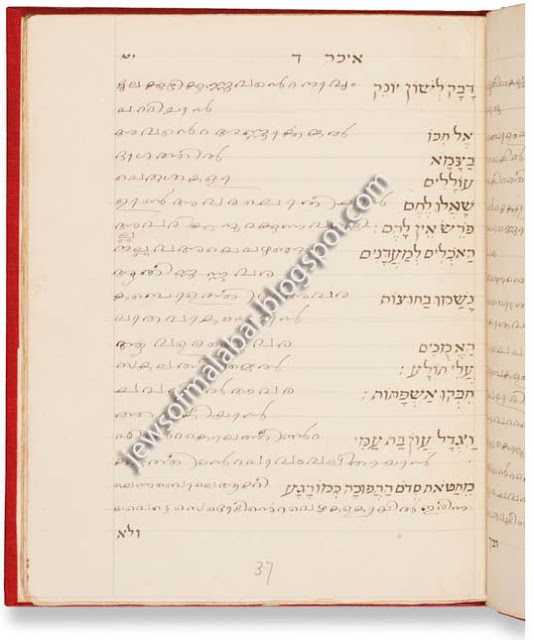 Sarphati was a skilled Sofer (Hebrew scribe) and he is also considered as local historian and his Hebrew history record of Cochin Jews dated 1874, (which is a collection containing various records/data of an early date of 1663 to his time) is mentioned by David Solomon, in his Hebrew and Samaritan Manuscript catalogue book "Ohel David". Sarphati's influence is seen in the different stages of publishing of Bailey's Malayalam bible, as the primary stage was started by publishing Psalms, followed by the 5 Books of Moses which are of high importance in Judaism. Finally the entire books was published in 1841-42. Cochin Jews held many translated biblical manuscripts owned by different people. 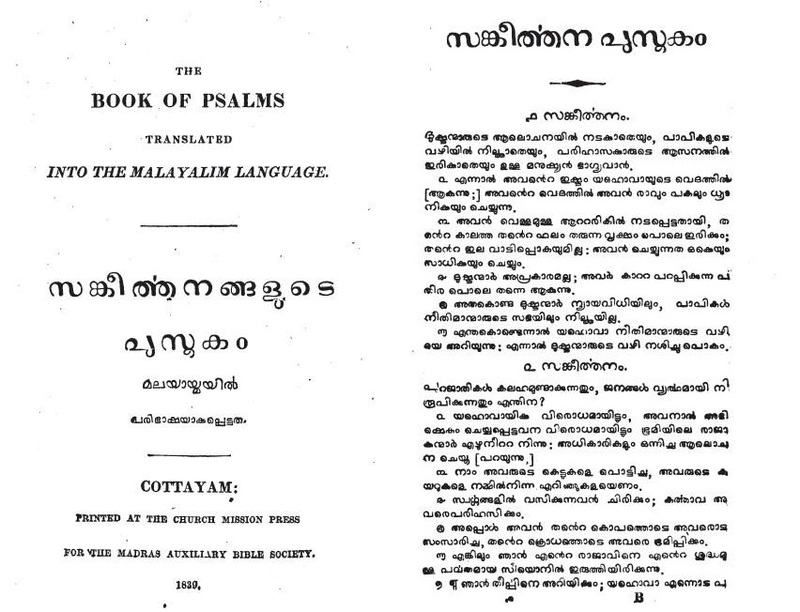 These clusters of Malayalam translation would have been an aid for Bailey's translations, few among the recorded Malayalam translations are mentioned in Ohel David, some with the name of the scribes and owners too. Book of Esther, with Hebrew text and Malayalam translation. 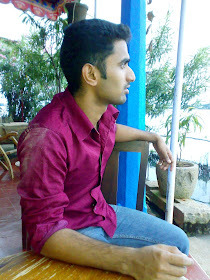 for Siniora Rahel Eliyyah Rahabi at Cochin. Commentaries to the Book of Lamentations, with Hebrew text and Malayalam translation. 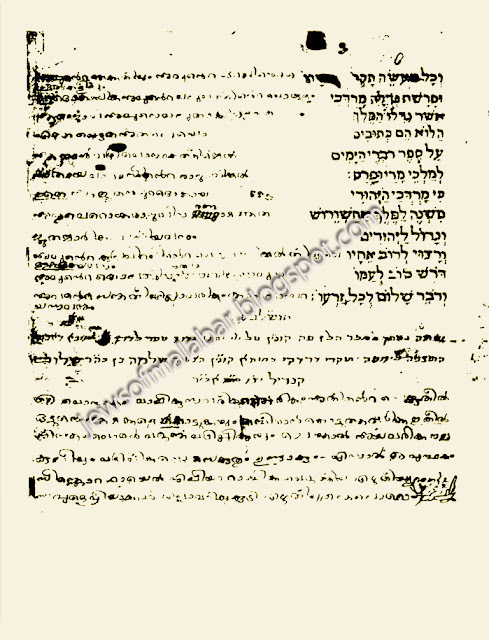 Cochin Jews had numerous manuscripts of occasional prayers, liturgical poems and hymns similar to those of Aleppo and Baghdad Jews. Midrash Eikhah,The Pethihatha , with Hebrew text and Malayalam translation. 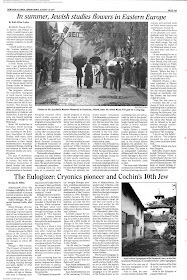 Cochin Jews had local Hebrew poets like David Castiel, Levy ben Moses Beliliah and Kabbalistic mystic and poet like Nehemiah ben Abraham,(Naamia Mootha), a Yemenite Jew settled in Cochin. The famous Andalusian poet and philosopher Solomon ben Yehuda ibn Gabriol's works along with, poet, physician and philosopher of Tuleda Rabbi Yehuda Ha-Levi's works were well celebrated in Cochin. Some of those poems were translated and became part of Jewish Malayalam folk songs. Lots of texts were lost in time, it was worth that some were preserved and recorded its existence. But unfortunately most of the above mentioned manuscripts and incunabula collected by David Sassoon mentioned above were auctioned by Sotheby's of London in Zurich and in New York, between the years 1975 - 1994, in order to satisfy the Sassoon estate's British tax obligations. what remains of David Solomon Sassoon's private collection of Hebrew manuscripts is stored at a Canadian University library. A later manuscript of 1892 A.D by Eliyah Haim Hallegua, which includes Pirkei Avot, Lamentations, Songs of song, liturgical poems also had Malayalam translation phrase by phrase in parallel columns. The manuscript is a bound book, and "The Jewish Theological Seminary." is the current custodian of it. "A Reply to the Letters of the Abbé Dubois, on the State of Christianity in India"